Zaroon! Zaroon! Zaroon! Let me count the ways I detest thee! As a thinking being, I gnash my teeth every time this man opens his mouth … nothing he says or does makes any sense to me. On the other hand, as a non-thinking being I am totally enjoying watching Fawad Khan displaying his acting chops and bringing the problematic Mr. Zaroon to life. I hate Zaroon Junaid, but love Fawad Khan here. Not to be left behind, Sanam matches Fawad every step of the way. They are fabulous together – both feeding off of each other’s energy to make an otherwise problem-ridden episode sparkle. 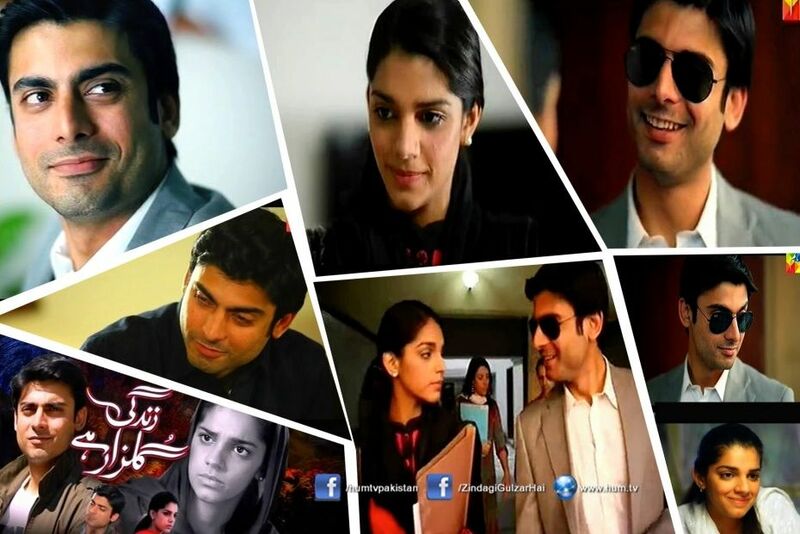 Yes, these were the moments we had been waiting for ever since the news about Zindagi Gulzar Hai’s adaptation for TV first hit the social media. These were the kinds of chemical explosions we had been expecting since the first few episodes. That these did not happen in the university days, and we were made to wait for fourteen weeks for the sparks to really start flying has been the subject of many a debate. In any case, now that we had the much awaited Zaroon-Kashaf scenes, was it worth all the wait? For me, execution-wise, the Zaroon-Kashaf confrontations were superbly done by the director and her actors. Narrative-wise, these confrontations should have happened much earlier, when they were university students. Coming as they do now, with Zaroon and Kashaf both having entered the professional phase of their life, these confrontations lost much of their steam and ended up looking like silly spats between high school kids – he the overconfident jock and she the straight-laced nerdy student. Like its predecessors, this episode too was riddled with continuity and editing errors. It was funny to see Zaroon, Kashaf, her boss and the two gora guests wearing the same clothes in the office meeting post their site visit, as they were wearing when Zaroon was re-introduced to Kashaf at the end of the last episode. Moreover, Badin has never been as close to Karachi as it seemed today. Was it that Kashaf had come to Karachi for a special meeting and then dropped in to see Sir Ibrar? Most importantly, when did Osama and Kashaf ever become buddies? Considering how anti-elite Kashaf had been during her university days, it was a little disconcerting to see her now on buddy buddy terms with Osama, so much so that he has now proposed to her? It was not just me, even Osama’s best buddy Zaroon seemed shocked! Also, when did Kashaf get over her issues with the spoilt, over-indulged children of the upper class. Finally, first Zaroon, now Osama… what’s up with Kashaf addressing these guys as tum? Apart from giving more screen time to the lead pair, we also saw a quick glimpse of Sidra. Mansha Pasha glowed as the obviously happily married Sidra. I loved the sweet moment between the sisters, and its heartening to see the bond between sisters surviving post-marriage. Shehnila too put in a guest appearance. I enjoyed how Shehnila sided with Kashaf on her stance on marriage. I wonder why Rafia is surprised to hear Kashaf refusing to get married. With a role-model like the loser Murtaza in front of her, it is probably very hard for Kashaf, who probably has seen and remembers a lot more than her other two younger sisters, to happily jump in to a marital relationship. Finally, once again, a humble request to the techies in charge of the background music – could you guys please find some appropriate music to go with the onscreen narrative? Thori awaaz bhi kam kar dain please, its really hard to hear over the very loud music – thanks! What did you all think? Was this episode gulzar for you? Looking forward to reading your thoughts! Thanks SZ for staying up and writing this review 🙂 Hope the zgh people appreciate it! I certainly do. Yes, this ep was better than most others but still can’t find anything ‘sparkling’ in it….much as I would love to. Basically the starting ep.s have been so bad that now the interaction between the couple doesn’t make sparks fly for me. I hope once the romance starts it might be better. I don’t find Z’s behaviour that bad. After all he’s just trying to make some small talk- not as such flirting or taking advantage of K. On the other hand K is ready to bite his head off. She’s one aggressive female. Actually I am disliking her more than before now. Ooper se wardrobe bhi itni bura kai that doesn’t help either. Simple clothes can be prettier than these surely. I was surprised to see K calling Z and ‘danting’ him while the car is being driven by the driver? How in the world could she do that? And yes, all the ‘tums’ being used? It was funny the way Z tells K to call him ‘Aap’. Wonder what logic K has for that. And how come she went out with Usama (plz Usama, get rid of those gross t-shirts, You’ve grown up now I think)? No problems there? The screenplay is strange. While last week they bombarded us with two similar tracks, this week, they suddenly decided to lessen the torture and not mention anything about them. All these little things just don’t make ZGH gulzar for me. Am only watching it for FK otherwise there are many other shows around which have a run-of-the-mill story but a good flow to it. @ Afia: I agree with you 100%. Our dear heroine K is totally charmless & on top of that she is brash, Ill mannered & rude. I have no idea why a charming & well mannered guy like Z would be interested in her. As I watch FK in this play & the misery on his beautiful face, I keep on remembering this Indian movie, Qaid main hay bulbul. HAHAHAHAHAHAHAJHA I just fell off my chair …. @Mona – I think Zaroon is totally enjoying the cat and mouse game. Sometimes he does get stumped but he then comes back with something else – even though it takes him a bit 😉 Def. no misery – I think he’s loving it. They both are loving every bit of it .. But dono ki ego eik doosre se bari so neither will ever admit! I have to agree with Afia in every respect . I really don’t care about the continuity and even poor Usama’s tee shirts . I cannot see any sparkle or any chemistry betwween the lead pair . I know the poor souls are trying ,it is just easier for Fawad’s character as he is the shall we say ahem ahem “playful one”? I think someone told Sanam Saeed that you have to act bitter angry and unyeilding and don’t you dare forget it. I find this whole scenario strange and unrelateable.. Simply the idea that Kashaf stood up to Zaroon in college is not enough to bas a marriage on.. Personally I think Kashaf deserves better. The only reason I like Zaroon is Fawad Khan ‘s acting otherwise ……aaaargh!!! Same here. I am going to echo Afia’s comments. The 2 leads’ scenes are such a long time coming that when they happened after 14 weeks (minus a couple of college epis) it didn’t do it for me. I was ready to get excited in whatever capacity they would deliver epi 14 since I wasn’t expecting much at all, but yeah no sparks, sparkle, wah wah moments. They were alright. I haven’t even gone back to re-watch the episode when I had done that with some of the college epis. Like you said, it’s like a bunch of college kids battling it out rather than grown up adults with a professional and almost sobering career. I would have to agree with Sadaf, at this point I am watching it just to see how Zaroon convinces K to marry him after he has made a complete fool of himself every single time. Maybe he will rescue her from some dakoos a la Indian movie style and K will change her mind 😉 Let’s see what Umera Ahmed has in store for us after turning Z into a complete jerk. @Afia, @Sadaf, @Annie: Looks like we’re all on the same page here… Too little too late coupled with all the other issues that we’ve had al along means that I too am watching it now primarily for the actors rather than for any stake in the story ..
@Afia: Agree, Osama needs to stop wearing the same clothes after how ever many years have passed … those in your face t-shirts are not helping his case! This was an amazing episode and it has many sparkle moments. You guys didn’t enjoy it doesn’t mean it was not a good episode. Sorry but you guys have made a habit of this rona dhona and ye bura tha,woh kyun tha, ye kyun nhi tha, zaroon ne ye kyun kaha, kashaf ne aese react kyun kiya, sara, asmara issues n blah blah session after every ZGH installment. Sarah I liked the episode but am not in love with the serial . But you have permission to disagree and love it and tell us all why we are wrong that is the point of these blogs . I agree with you @sara. I think on a positive note, I see Kashaf has changed where as Zaroon hasn’t and the portrayal of a strong women who will perhaps change Zaroon’s thinking I’d underway…and I have not read the novel so that’s what is m hoping for…who knows, so let’s not over analyze, with due respect lets leave it to the critics to critique every single frame, I am sure many of us don’t have formal education or experience in media to comment. In the end overall a nice episode with lot of Fawad and Kashaf and if felt it was entertaining, and eagerly waiting to see how the proposal is made and accepted!! I loved the episode. I don’t even feel the need to explain why because it seems like this forum is more or less as Sara put it..the rhona dhona about ZGH. Lol, yes, everyone has their own opinion and whatnot…we do get it..but I fail to understand how there is yet to be a positive review on any episode of ZGH. This is one of the better dramas out there today, and if you guys have so many problems with this show I can only imagine what you guys say when watching all the other shows. And, before I get the lecture on this is a blog…freedom of speech..we can say whatever we want (and yes you are)..but there are way more negatives to these reviews than there are positives. I’m sorry, I don’t see how you guys even bother watching this drama on a weekly basis then? because of Fawad Khan? If the story, editing, direction, music, clothes etc are so bothersome..then how is Fawad Khan the saving grace of the drama? Sometimes Its not good to criticise just for sake of criticism. Yes there r major flaws in the drama the progress of the plot is extremely slow, and there were mismatched scenes, still if there was heavy editing to kill the continuity I think it was the right thing to do. They can’t reshoot only re-edit to correct the major “bhunds” they’ve committed in producing this drama. I’m surprised to see the reviewer making the case for episode 14 to look more like the dull, repititive and boring episodes [from 11-13] that were putting ppl off. Basically these subplots of Abba Murtaza/Nigar, Farhan/Sara, and Asmara[post-college, engagement] were never part of the original story. These additions have’nt served any purpose only stalled the progress of a great story and cause a drift from the central plot. Apart from Sidra [Mansha P.] there is’nt any good actor in the cast that added any value to their characters. I did’nt watch episode 12 or 13 on Friday thinking its a mistake, but later when I did in hoping that there will be some move on, I was extremely disappointed. At least that did’nt happen in the current episode. Ayesha Omar is like the Veena Malik of tv, off course there r the likes of Mathira. But she is’nt stupid, actually she is alien to most of the concepts of culture or values of a Pakistani society, there is active hypocrisy going on just to take a paycheck portraying someone you don’t have anything in common with. Her various snaps hav been circulating on the internet for sometime, but that little miss jihad episode convinced everyone whats going on in her head. I avoid watching her [unfunny sitcom like Bulbulay] and only bear to watch her cos I like the drama ZGH. Mehreen Raheal is just a bad actor and plain boring. The excessive use of English in an urdu drama by the likes of Sheheryar Munawer and Mehreen R. is actually to cover the acting issues that they have. The less of these above-mentioned stalwarts the better for ZGH, and for the ratings. After wasting more than half of the drama on the various boring stories, ZGH needs to return to the main storyline that is the main lead Zarun/Kashf and their lives together. I enjoyed this episode. I feel we watch it every week anyway for the real story to come and bearing through the sara/ farhan sidetrack was too much for me. They are divorced, junaid even told ghazala they had to pick up the saman…so I don’t think there is much left for them to show this episode..I really didn’t want to see her again lol I am glad so we could get back to Zaroon and kashaf! I am still very much interested in what will happen ie how does Kashaf accept the proposal and what their post marriage life will be like, so for me the story still holds promise even though we have had to wait a long time with lots of subplots to suffer through, and obviously the acting is brilliant of both FK and SS which also keeps me glued. I still find that their scenes are excellent together, for me the way they quip back and forth shows how comfortable they were with brilliant chemistry and the dialogues were very witty and good. Obviously Zaroon hasn’t changed, he looks even worse now because apparently he’s engaged and still fitting with kashaf!! I hope this guys learns something soon! I am also wondering how she has become good fiends with osama? At this point to reject osama who she actually respects and acccept Zaroon who she detestable would be stupidity! The promo is pretty suspenseful like last week..will Zaroon redeem himself ? Who sends the rishta? I am actually excited..
One of you mentioned that this is one of the best things on tv nowdays. I beg to differ (but plz don’t trash me for that!). I think these are some of the shows which are better made, better directed and have a more coherent screenplay: Silvatein, Talkhiyan, Siskiyan, Na kaho tum mere nahin, Mirat-ul-Aroos, Ghao, even- Mera pehla pyaar! No one’s forcing anyone’s opinion on anyone else. Just because majority of you agree with SZ, doesn’t mean those who disagree are being rude. I truly feel that there’s so much of nitpicking going on with ZGH rather than criticism. There’s a difference and it’s evident here. How many people are disliking this show? Hardly any..do you guys think people are either not taking note of the small bloopers/details or instead people probably are, yet the overall efforts of everyone is a bit more important than what colored shirt Usama is wearing in possibly the one episode in which he showed massive improvement as an actor? Most of us have been impatient about seeing Zaroon & Kashaf scenes, and in the one episode where we actually viewed so much of them, we’re wondering about why they put Asmara & Sara’s story to the side? seriously? The background music causing an issue? I hardly pay attention to that and I have yet to see that come in my way in terms of hearing the dialogues..but if that’s a problem to many then I can understand..though the only complaints I’ve heard about that is from this blog. Moreover, every show has such small bloopers or mistakes or whatever we want to call it. The overall picture is usually what critics look at it. We all watch movies etc and read reviews on those review sites..they too complain about certain things etc but their overall conclusion is based upon the overall product..not the nitpicking…which is why I fail to understand how Umera’s writing is hardly mentioned in any blog here..Samina Peerzada/Waseem Abbas/ Sanam Saeed etc are not even as worthy of watching the show as much as Fawad Khan is.. It’s actually sad to hear that most people here, find Fawad to be the saving grace..even though Fawad just started becoming prominent in the show, so what was being watched before? Sanam? Samina? Waseem? Mehreen? Point is this is show is not about one person and hasn’t been..everyone’s trying to put their collective efforts in and it’s obvious..yet the majority of the people here say the saving grace is Fawad…it’s just mind boggling and a case of favoritism to me, and I’m as big of a Fawad fan than anyone here for the record. I’m not telling anyone to see it from my perspective…or to agree with me..point is how is anyone else not as worthy of watching this show as Fawad? I’d love to know. I agree Fawad is a wonderful actor and he’s such a good looking guy..but why less or no credit to anyone else? And, I’m actually referring to majority of the people here..as it seems like that’s what everyone here thinks. Also, I have read so many other reviews here..for example: Shehre Zaat’s reviews. I loved that show…with that said, that show had so many loopholes and it dragged as well.. not to mention how parts of the story went over my head as Falak’s desperation for Salman and her obsession with that statue was no less than a high school girl’s melodrama…even Mahira the actress was weak in the first half…but that show was praised to no ends on this blog despite so many people having a problem with its depiction onscreen (considering it was a novel adaptation). Is it because Mahira, post Humsafar is just a household favorite? or is it because the overall product was just praiseworthy and heart touching that we all ignored the minor faults etc? I’d like to think the latter. Point is, we didn’t nitpick..here that’s not the case. And, I’m sorry if this comes across as straightforward/rude or whatever else..but these are my honest thoughts and observations since months now. Consistent reviews which hardly show much of what the show is actually showing is a bit questionable…this thing where why was so & so not included this week, yet last week..Kashaf’s posh accent..Kashaf’s dupatta today and not last week..Usama’s shirt..the background music, too many scenes with Kashaf’s family yet when they show less of her why no scenes of them etc etc..is just nitpicking. And, yes once again..everyone has their own opinion..but with this site being a site that posts reviews and is one of the few reputable ones out there..I feel everyone’s just always talking about the things that aren’t of that importance..and here, ZGH’s reviews are more or less based upon that. And, @ Afia: That’s like me saying if you guys don’t like the drama or just watch it for Fawad..then perhaps you can just not watch the entire show at all? or just skip to watching Fawad in the show to save time and energy? I believe that the problem is not with the reviewers. It is with the channels itself. Since the last 2-3 years, channels like Hum and Ary have produced many dramas which have attracted a huge audience for dramas. And Hum stands out for making QeT, MAQH, Mastana Mahi, Mera Naseeb, Humsafar, MeJ, DeS, SeZ, BA, and now ZGH (plus many more). With all the above mentioned dramas, our expectations have quadrupled from every drama from these channels. When we do not find what we expect we start to criticize which is completely fine. But perhaps the critiques are the ones who follow Hollywood and Bollywood, (and maybe Turkish) shows so they have a natural tendency to compare shows like ZGH to foreign shows. I myself believe that ZGH has not completely lived up to our expectations but frankly speaking it has the X factor that makes us wait every week anxiously for Friday 8 pm. If we look back the drama industry is perhaps a few departments of this country which have by their own efforts (without the support of the government) gone in a positive direction and is getting bigger and popular by every passing day. Therefore I believe that we have every right to bash but let’s not be too harsh because our dramas (including ZGH) are slowly and steadily improving and we need to support and praise them at the same time for the quality of work. Let me clarify , I don’t watch Turkish dramas . I don’t watch Indian dramas . I watch some American and British Tv but those are totally different cultures and richesr countries and I never compare Pakistani dramas to them . Thanks S.A for clarifying and I agree with you completely! But lets agree that we all have our opinions and prospective so let’s not go over the top in each direction and be respectful to each thers views and even the creators of the show. There is a lot that goes in producing such dramas. And just to clarify i enjoy the review and hence I wait anxiously post each episode to read it. But alas! The subsequent over analyzing becomes a bit too much sometimes, but as stated earlier it is each individuals opinion and I will ignore anything that I don’t agree with in the future:-). Enjoy the rest of your weekend. Well now, doesn’t that feel better ?. I think you guys have been silently seething at some of us on this and Dp for sometime and perhaps this is a good moment of Catharsis for you. I think you guys misunderstand the “nit picking ” comments on continuity and bloopers ,they are a littleannoying but ofcourse don’t ruin an overall drama , and some of the so called nitpicking is not an attack on the actual drama per se more in the line of running jokes between friends. I feel your pain guys I loved Sheher e zaat and got incredibly frustrated when people picked holes in It , similarly. when the long knives were out for DeS and Humsafar for showing regressive stereotypes of women I was very upset and disagreed vehemently. As to Fawad being the saving grace and not taking notice of actors like Waseem Abass and Sameena Peerzada and Sanam saeed. I have the utmost respect for veteran actors such as Waseem Abbas and Sameena Peerzada but I felt their tracks took over the story and that is the writer and directors’ fault, not theirs. They have as I have said before done their respective roles well . As to Sanam Saeed , I liked her in other roles but I feel Zero empathy with this character Kashaf ,I really dislike Nashukra pun in any form ,However, I realise Umera Ahmed has deliberately written her this way to illustrate a point The idea that a player type like Zaroon has not matured or learnt anything but is desperate to now marry stiff as a board ,unyeilding ms angry at the world and Allah Kashaf is beyond my imagination . However every week I take a pinch of salt and swallow it down and because yes I am a Fawad Khan fan …Zaroon is another dreadful character , what ever Kashaf’s faults she is written as a decent caring person why would she marry this person who is just going to cause her more misery. I have been hanging in there for so many weeks and finally this week was a pretty good episode as I think SZ pointed out in her review. I think next week is going to be even better. Now that Asmara and Sara have been slowly phased out . I actually admire Umera Ahmed’s work and appreciate her as a thinking persons’s writer ,and that may well be the problem she has set such amazingly high standards that this thing seems to be falling short in my eyes . As to there not being good reviews I personally wrote literally glowing reviews for episodes 2 and 3 go read them at Dp.. Anyway glad you guys got that off your minds and feel free to disagree but do return the favor after all we are basically all fans of Pakistani dramas and we may well agree on some things too if not now but perhaps later . silently seething? lol no one has that much time, I’m sure. To be clear, I loved Shehr e Zaat with all my heart. I felt the theme was so well illustrated and that overcame my issues with such minor faults. Every Pakistani show is flawed technically in way or the other..I don’t find it so problematic unless it really comes in my way to understand the story or what’s going on in a particular scene. If you guys feel differently about that or it’s something you as friends like to discuss amongst yourselves then that’s good to know. Personally, I think that’s nitpicking more than critiquing. I too have my set of issues with this drama in terms of editing but I feel the overall product has been decent in terms of acting, story etc that I can overlook it when discussing the overall product. See, disagreeing on the story bits, or the acting is fair enough..I don’t quite understand the big deal in the small bloopers or technical errors being examined like Usama’s shirt? and it seems like that’s actually a big deal. lol.. I mean why not mention how Shehryaar the actor seemed to have made such a massive improvement in yesterday’s episode? Once again, I am in no way telling you guys what to discuss and what not to, but according to what I have observed this drama is more or less degraded based on small details which I have no clue about while watching the drama..but discover once I come here. Apart from that I love Fawad Khan as much as anyone else…but I feel he isn’t the sole purpose for this show doing so well amongst masses at least if not everyone here..especially because he hasn’t even been the prominent character from day one till a few weeks ago. For that reason I think credit should be given to everyone and not a single star. Also, I can totally understand your problems with Kashaf and her character..but, I still feel that Sanam’s acting chops have improved tremendously and for that she’s doing quite well. There’s a difference between a character being annoying and an actor/actress being annoying..and the latter is not true for Sanam at least in my mind. I have read this novel and it’s a short one. I feel they have added so much other things to lengthen it..and to the extent where they have neglected Zaroon & Kashaf scenes in the beginning. I completely agree with that part..but I didn’t expect just to see Fawad & Sanam throughout the first half of this show, and with + everyone else doing decent enough, I thought ZGH has been pretty good so far..but that’s me. Also, I feel Fawad & Sanam Saeed have looked amazing in all of their scenes. They have this unconventional chemistry that clicks. Umera’s lines with Kashaf have been spot on too..I feel she’s showing real characters. Though I do understand where you’re coming from when you mention how Zaroon’s character is so confused and I agree..but when we can tolerate his jerk-ish character because of Fawad then it’s only fair to say mostly everyone else has been doing decent too, despite the flaws associated with their characters. Once again, by no means is this to vent frustration or whatever. We all can’t agree on the same thing and that’s understandable. I wrote what I feel when I read ZGH reviews, and if that’s an issue..well I guess we can agree to disagree. We will have to agree to disagree and hopefully show respect for each other’s opinions. I see zero chemistry between Z and K not because of Fawad or Sanam but because of the characters written by Umera Ahmed. Having said that your good self ,SZ and a others do… so enjoy . BTW I don’t think Sanam Saeed is annoying I think she is a very pretty , talented actress ,whom I loved in Mera naseeb where she and Imraan Abbas shared amazing chemistry and were the cutest couple . I also thought she was literally the only reason I watched Mata e Jaan to the end because Although i love Adeel Hassan , the character of Abi annoyed the life out of me. Sanam looked so beautiful and strong and confident in that role , That is how I see her. Not everything is going to be according to my liking but I reserve the right to express an opinion about it . @Aiman: thank you for taking the time to express your detailed opinion. I think many of us have said this so many times ke we all are enjoying various parts of the story, as you yourself pointed out in the example of your mom. So kisi ko kuch pasand aata aur kisi ko kuch, na aap ghalat na apki mom ghalat, na main ghalat, aur na koi aur ghalat, hum sab apne apne hisaab se dekh rahe hain aur alag alag cheezen appreciate kar rahe hain. Episode 17 …but how he convinces her I have no Idea….that is one thing I am eagerly waiting for! Rehmat I think I have seen spoilers so I have an idea but they may have changed the screenplay, hoping it is more convincing on screen! @Rehmat – Thanks so much!! your effort is def appreciated!! 🙂 Sounds like a very cute scene…but I think I’ve read this somewhere else as well so no worries you are not giving away any spoilers! I hope they dont change much of this around in the drama! agree with SK I think wedding sequence around 17. I had earlier predicted 18 or 19 but looks like they are moving the Z-K story along at a brisk pace now that all the other stories are done with. @Rehmat – I also think episode 16.. Hehe jk. I think it’ll be the last episode. Please don’t mind me saying that Kashaf is not as much nashukri and repetitive as you are in all of your reviews on zgh. When you post your links on every page inviting people to read and comment on your reviews of their favourite plays then you should be FAIR and IMPARTIAL in analysing these plays. At least in the case of ZGH I as a regular reader of your blog do find you highly unfair and biased against this serial that’s talk of the town everywhere. No one including me is asking or forcing you to like a play if you don’t like it, all I am asking is to avoid those silly and stupid comments that you are so fond of making on the production house, the director, the writer and the actors. You were the one who was consistently talking against doing any comparison between the book and the screen version. And when it came to zgh you continued comparing the book and the play so often that it started getting annoying. Woh college scenes kyo nai daale, ye college scenes kyo nai daale. At least you should not be the one who were making these comments as you always held the stance in all your earlier reviews on book adaptations that the viwers should not be bothered if the director or the writer changes the screenplay from the book. Then you also pointed out in one of your earlier reviews that why umera repeated a wedding card sequence in meerat Ul uroos. You have never pointed out such repetitions in other serials that you are reviewing. Is it fair on part of a reviewer to quote a serial that you are not even reviewing? And then commenting negatively about it? arrey Rameen bibi thoda thanda paani pijiye and have a little chat with Falak’s Naani – dil ko bohat sukoon milay ga. This is the world of entertainment, let’s take it for what it is. It is not a matter of life and death and everyone has the right to express their opinion. We as human beings have Much Bigger issues to deal with to improve ourselves and the society around us that it really doesn’t behoove us to keep on attacking drama reviewers. I see it this way – the time that I can take to get frustrated about someone’s comment and lash out at them can instead be used to do a good deed for a person which will make my Creator happy with me. When I am lashing out at someone, I am losing some of my inner goodness while hurting the other person in the process. Something that I know my Creator won’t be pleased with. Since you are an Umera Ahmed fan, I am sure you are close to your Creator since UA talks about that at length in her work. Let’s pass around goodness to one another because there is already enough ugliness that we have to deal with on a regular basis. Oh in that case the reviewers and the viwers like you should also stay away from picking up only the negative things. Aap bhi agar negative cheezon par apna focuss Kum kar dain to behtar ho ga after all you are preaching me to be calm and relax and be positive. It’s not binding on me to get influenced by everything that I read and watch. I have a thinking head and know well what is right or wrong. Don’t need falak’s naani for that job. I think you completely missed my point – it is entertainment and take it for what it’s worth i.e. everyone can comment as they please. There is no need to get personal with anyone on the blog. Each person has the right to their opinion as long they are not making hurtful comments toward someone personally or their beliefs. My suggestion again would be to post your opinion regarding your thoughts on the drama. Again it is entertainment after all. And again there are much bigger problems that we face on a daily basis than a 30 minute episode. I think it’s you who are fond of getting personal not me. I didn’t address you in the first place I was addressing SZ. You had no need to jump in and start advising others what they should drink or hear to to calm themselves. Everyone knows how to hit back if you would ridicule them by saying that they should be close to God if they are reading umera ahmed. You would say oh I was just joking and nothing else. Meaning your insults should be taken as jokes and others should mind their language when they retort back. Lets each mind our own business and not hurl any muffled insults and teasing comments to rebuke each other. Kashaf laughs and Sidra smiles bc they always understand each other.. Such a sweet scene! LOL @ Ash I know when I read it back I thought of Sidra too 🙂 We need Sidra to come to this blog and give everyone some thaanda paani to drink. I never thought a drama serial could be a cause of such hurtful and insulting words toward fellow human beings. Rameen I agree regarding the fact that we should try not to compare novels and screenplay as they are different medium. However my own personal view about zgh and I had not read the novel was that in the college scenes I really could not understand why kashaf hated Zaroon so much in the beginning. Except for the churail scene when he never knew who she was, he was never rude, never put her down for being middle class andnever personally attacked her. I would therefore have liked to see some scenes that made her hate him so much. There was that one scene, and i felt Kashaf was the rude one. So for me I went looking for spoilers because I wanted to understand their relationship and realized the novel did show why kashaf had hated Zaroon. I’m sorry but a drama can be different but it should be able to convince me by showing me events to justify feelings . I definitely felt for her later on when Zaroon plotted against her , as she had a big reason . Did you feel they explained it well, would love to know! I am still watching it, I like it but if I don’t understand something I would like to discuss it, that’s what a forum is for. @ SZ 1 thing i like abt u keh aap apne uper criticism ko bare dil keh sath accept ker lete ho warna to log counter attack kerna shoro ho jate hain……nw coming to ur ques i think epi 17-18…. Waisey do you think Kashaf will give in b/c she falls in love or some other reason? I personally like Kashaf’s strength of character and would not want her to give in araam se .. The “dheet” dialogue was muffled on the version I saw and I was wondering what he said to himself. for some odd reason even the link that Hum posted on their YT channel has the phone call missing. Ahaan and this scene seems so new to me.. as i didnt saw this one! waqai ur right i better check for full drama 🙂 awww thankyou..
@Rehmat – no problem.. next time just ask me for the full ep link! 🙂 … i dk why people post links with cut scenes, as if its not editted out enough. Not really sure who it was but someone had given a great explanation of Kashaf’s character, and boy were they right. This woman complains too much for her own good! Yes i agree with some of her thoughts but overall she is so unappreciative towards everything so i don’t understand how God can reward her with Zaroon. Yes a reward indeed bc he has never really done anything out of line to her except that whole library scenerio which she brought on herself because she’d given him so much attitude when all he was trying to do was be nice to her and all because of “he was rich and had everything in the world” and so that pissed her off.. Hello!! , where is the logic in that. This woman needs more then just thanda paani.. In fact this is a match made in heaven. They both are so perfect for each other. Puri umar larte rehain and kabhi na kabhi pyaar bhi ho jayega. Although most of her complaints are pretty ridic, i do have to agree with her when it comes to her aggravation about marriage. Why is her mother nagging the crap out of her ke beta shaadi karlo shaadi karlo and not providing a single positive factor about it. Matlab she’s had a horrible experience and she only other reason is “zindagi ban jayegi” kaise ban jayegi?? jitni uski maa ki bani hai”?? why not more logical reasons ke one needs a partner, a relationship in which the other person totally understands them, just anything we as the viewers can relate to? Anyways i really wish our culture did not have this mentality ke a woman is a useless being unless she is married no matter how successful or content she is in life, she must get married to be accepted in the society. This entire thought process just pisses me off. Enjoyed their scenes and in which each one Kashaf initiates the argument. Zaroon didn’t grow up but neither did Kashaf.. Now, in their respective professional fields and still arguing like they are in college except no Asmara, Osama or Maria to back them up. Too bad Kashaf does a horrible job hidiing her love for him, she passes a very sweet smile when headed home after the first day of work. Btw love how no one changes their clothes throughout the episode. And Mr. Osama hasn’t changed his clothes in the past 4 years. How is it possible that he invites Kashaf for lunch and then wears the same exact clothes the next day to lunch! I mean come on, hadh hai! Loved the new and improved Sidra in this episode.. So glad they showed a glimpse of her. She was looking lovely. I love her enthusiasm for Zaroon. It cracks me up.. Reminds me of two/few friends discussing the hottest guy in their school except Kashaf is a total buzzkill cause she’s always so bitter about it. But nonetheless they both really understand each other and have great chemistry. You can tell that Sidra is still the same old bubbly , very caring sister, she was four (?) years ago, reminding her sister to eat and drink water and to calm down just like she used to before. Loved that scene between them. 3 times LOL 😀 that was epic comment Ash.. specially that para about grown men chilling on car trunks.. too good! @ Ash first of all “i don’t understand how God can reward her with Zaroon”… u seriously think a man like zaroon will be a reward to any women in any case???? ” she brought on herself because she’d given him so much attitude”…..a person who hate elite class bcuz of what ever reasons what r u expecting her to do??? and usper zaroon ka zabardasti ka friendly behaviour…now tell me how u gonna behave if some boy/men in ur life will try to b friends with u halan keh u r not at all interested in him…aur esp jab woh zaroon ki terhaan chipak jai….u will definitely get irritate i think…….so tell me how well u behave with ur fellow beings when u r irritated or frustrated by something/someone (keeping in mind that for kashaf life is not a bed of roses) she was rude to ppl esp ppl like zaroon and asmara bcuz life mein usko woh asanian nahi mayassar jo uske clg mein zaroon wagera ko mayasar thi…wohi kashaf zaroon ko aapke khayal mein attitude deti thi Maria/sidra/rafia se kaise baat kerti thi yeh dekha aapne???? kashaf Izzat sirf un logo ko daiti hai jinko woh izzat keh kaabil samajhti he (see the difference..how she talks to sir abrar nd her father)…and zaroon ne i think koi aisa karnama anjaam nahi dia tha library incident se pehle jo kashaf uski izzat kerti (keeping in mind she hates elite class esp materialistic ppl like asmara )…..now recall 1st epi..imagine some 1 calls u churail and u r standing right behind that person…how well u gonna behave with that person??? esp koi woh shaks jisko aap waise hi na-pasand kerte ho…..u said isme logic kahan he to hate someone jst bcuz he is rich etc..my question to u is kia aap apni life mein saare kaam logical kerte ho???? especially heart affairs to illogical hi hote hain..aur pyar aur nafrat i think insan dil se kerta he…aur some how kashaf is right in thinking keh hamari society mein log ghareeb se ghareeb ter is liye hote ja rahe hain bcuz humari elite class ameer se ameer hoti ja rahi he……now moving a little forward after library incident…u said a men like zaroon is still a reward….now tell me where is logic in tht..ek banda jo itni wahiyaat soch rakhta ho , jo middle class larkion ko izzat keh kaabil nahi samajhta ho… u said a person like him is a reward to women..now tell me zaroon ko reward karar dene keh peeche aap kia logic daingi (apart from keh this character is played by FK and u r a great great fan of FK)………hum jis mahool mein rehte hain humari soch aur zubaan bhi us mahool keh hisaab se hoti he..kashaf jis aankh se dekhti he usko sirf apni life ki miseries hi nazar aati hain is liye uski zuban karwi he ..thts y she is mostly rude to ppl…. Ok I wouldn’t call Zaroon a reward! Kashaf may be rude and what not but she did not deserve what he tried to do in college, ie all the plotting to bring her down and even right now he is supposedly engaged and hitting on her. I think they both have many issues they need to work through…and hopefully we find out how after marriage. They are both flawed, her with her nashukri and him full of himself…so let’s see what happens…eagerly looking forward to next episode! Ok what I mean by reward is Kashaf is no angel either. Fine shes not from the elite class but she is also arrogant and stuck up, and very very nashukri. If you guys remember in the beginning, Zaroon tried to genuinely be friends with her but she was pissed bc he was rich and had it all easy so she didn’t want to be friends. He called her churail but he said it to the girl whose name was the first one on the list, it could have been anyone. Coincidently she was standing right there and heard him, so she could have said “excuse me., you are being rude” or “you are talking about me and i dont appreciate it”, yaa jho bhi, but she decided not to and hold a grudge against him and all the other rich kids.. It makes no sense for her to hate people just because they are rich and she has to deal with hardships in life. Everyone doesn’t always get everthing. The rich are rich but are they happy and content? maybe not, and their money cant buy that for them now can it? Things are slowly changing for the better for Kashaf and yet she is still complaining and crying about the past. People tend to appreciate more when after hardship things ease for them, but not over here…..
LOL Ash @ your comment on “daily reality checks” – a marriage made in Vegas heaven! your college kids sitting on the back of the car and smoking cracked me up! I think Zaroon hadn’t gotten his paycheck until then so he couldn’t afford to take O out to a restaurant or coffee shop. He did that last week and O said some things that made him upset. He wasn’t going to repeat the same mistake and spend thousands of rupees on O again. Aik cig kaafi hai. Acha khair besides all…i wanna jst point out 1 thing keh S.Z u wrote “when did Osama and Kashaf ever become buddies? Considering how anti-elite Kashaf had been during her university days, it was a little disconcerting to see her now on buddy buddy terms with Osama”…. Plz recall uni days in ur mind….osama and kashaf were quite good class fellows..(remember scene in which osama was having sme regular conversation with kashaf in garden area and zaroon was looking both of them??) aur iss keh ilawa i think osama does not really belong to elite class as zaroon and asmara do..remember uni days mein (i dnt really remember episode no.) osama / zaroo / asmara kuch discuss ker rahe hote hain and osama, zaroon and asmara se agree nahi kerta to asmara says to zaroon “choro yeh nahi samjhe ga class diff he” (smething like that bcuz mjhe dialogues yaad nahi sahi se)..so i feel yeh itna ziada heran hone ki baat bhi nahi ab..haan thori bohat herani hoi thi mjhe keh clg keh over hone keh baad bhi they both remained in touch but woh toh osama ne khud hi bata diya na zaroon ko “all bcuz of my own efforts”…..
@Ash, SK, Aiman: I have to say our disagreements with ZGH aside, I thoroughly enjoy reading all the debates we have about different characters, their motivations etc..
@Aiman, nice insight you gave on Osama, I had always wondered about his background.thanks! @Ash and @SK: Yes, I too think Kashaf, ko ab thora kam complain karna chahiye ab .. LOL! even Sanam said that in her interview! @SK: Yea Zaroon is no catch! thanks for posting the Sanam mini-chat. Enjoyed her comment on why the drama is such a hit lol!! I hope Sanam doesn’t get any hate mails for that comment. Hola ladies!! Really enjoying reading the discussion here!! Lots of people have problems with Rafia being forgiving. But I really like that about her. Its every easy to become embittered about life like Kashaf has. But I think it takes great strength to forgive and move on. She teaches a really good life lesson that Kashaf completely fails to understand. I understand Kashaf’s anger towards her father but towards most of the world, thats what happens when you stop forgiving. Her strength is her pride and really in my opinion your strength should be much more than that. It should come from your inner peace of mind. But I do like her, because in my mind thats how most people are reality. Always searching for more. Never content. Again, as far as Rafia goes I think she wants her daughter to make peace with the world. Because thats a great way to find happiness. As a mother I would hate to see my daughter find superficial happiness like Kashaf does…in small successes and victories. Not that those are not important but I feel real lasting happiness has to come from a peaceful mind. Compare Rafia with Zaroon’s dad. I really do not have a positive opinion about him at all. Here is a man who likes to stand back and do nothing. Which is ok in itself but he gives silent approval to everything wrong Zaroon does. Not once has he said, look its ok for your mom to want a career. She loves you even if she doesnt show it . He may not agree with her but he need not make the divide between them so obvious to the children. Children always pick up on that and usually the outcome is not good. Rafia on the other hand, teaches her children not to judge their dad. Junaid gives tacit approval to all of Zaroon’s wrong judgements about his mom and women in general. I feel if at all he had supported his wife just for appearance sake at least even for a little bit then Zaroon wouldnt be like this. Maybe Zaroon would stop once in a way to look inside himself. To question what he does. Instead he goes full throttle at being who he has become. In my opinion Zaroon’s biggest problem is being second in the lives of people he loves. Be it his mom, Asmara and soon Kashaf..whoever it is..he wants to be loved and he wants security. He never got that as a child. But his dad could have alleviated that feeling and he never does that. I used to hate Zaroon. Now I just feel sorry for him. His insecurities now manifest in so many detestable ways when really its nothing more than wanting love that does not hesitate. @Aish – First off let me reassure, of course I don’t mind anything! Criticism of any sort is totally welcome. And that is what we are here for, to share our thoughts on a particular episode / character. I really enjoyed reading your comment and agree with you about Rafia trying to set a better example for her daughter. Maybe forgiving the father made more sense to her as an experienced mother then to us, who don’t think much before making choices when it comes to holding grudges, forgiving etc etc…. I loved your analysis on Zaroon’s dad and how this may be the reason for his complex personality. You are completely right on that one! You are so not rambling!! I loved reading your comment! A very important point about junaid, loved your analysis!. So true that both parents need to be on same page and need to defend each other in front of kids, even if they do have differences! @Aish – Fantastic observation about Rafia and Kashaf! I completely agree with you that your strength should come from making peace with yourself and others. And we know that Kashaf just puts up a front mainly of being strong in front of others because she has conditioned herself to do so. Interesting observation about Junaid too. You are so right that if parents are not on the same page on how to raise their kids, it is detrimental for the child’s psyche. In fact my husband and I were talking about it the other day (not in the context of ZGH) and how we have seen messed up kids where the parents don’t agree on how to raise them. For Rafia, from her POV she can hardly encourage her daughter to continue to be bitter and angry at the universe. I cant imagine any parent doing that. For Zaroon, I think his dad is a huge influence in his life. And I feel he is a bad role model. His mom is not perfect but dad isnt either and they dont work together. Right in the beginning dad says something like ‘I’m not going waste time on stuff that has no results like talking to your mom’ to which Zaroon says ‘phir toh yeh compromise hui’. I wish then and there he told him he doesnt mind compromise because he loves Ghazala. but he makes it seem like he is superior because he is adjusting and Ghazala is terrible for making him do that. Not once has he told him compromise is necessary in every marriage. If he had told him that then Zaroon would not go around arrogantly refusing to compromise with Asmara and throwing comments like ‘not every man is like dad’ in his mother or sister’s face. Loved reading your insights, and I agree completely with you on Mr Junaid. LOL! I went back and checked, and yes, I had similar observations in my 3rd ep review 🙂 …. But you are so right…if Junaid cared so very much, make a little less money and come home earlier!! the next episode has me so excited!! Cant wait to see Zaroon win her over !! @Aish: No need to be sorry, I am glad to see I am not alone in wanting to hold the dad equally responsible.. I think too often women are easily blamed and the dads get off scott free. Even in this latest episode, Junaid conveniently tells Ghazala to talk to Sara about some proposal he’s looked at for her, since Ghazala’s the one who is closer to the children… really?? when did this turnaround come about? I thought all along we were told Ghazala has no time for her children and neglects the house! SZ, great observation!! That was so silly !! Its a marriage proposal…why not both talk to her? He is always hesitant to say anything!! Its so strange! No responsibility as a dad!! I think he feels he only needs to provide monetary support…its probably more ‘manly’!